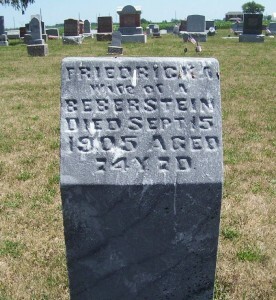 Friedricka Beberstein, Kessler Cemetery, Liberty Township, Mercer County, Ohio. 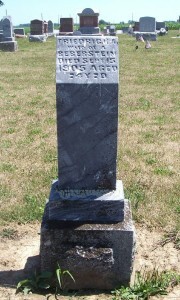 This is the tombstone of Friedricka Beberstein, located in row 14 of Kessler Cemetery, Liberty Township, Mercer County, Ohio. 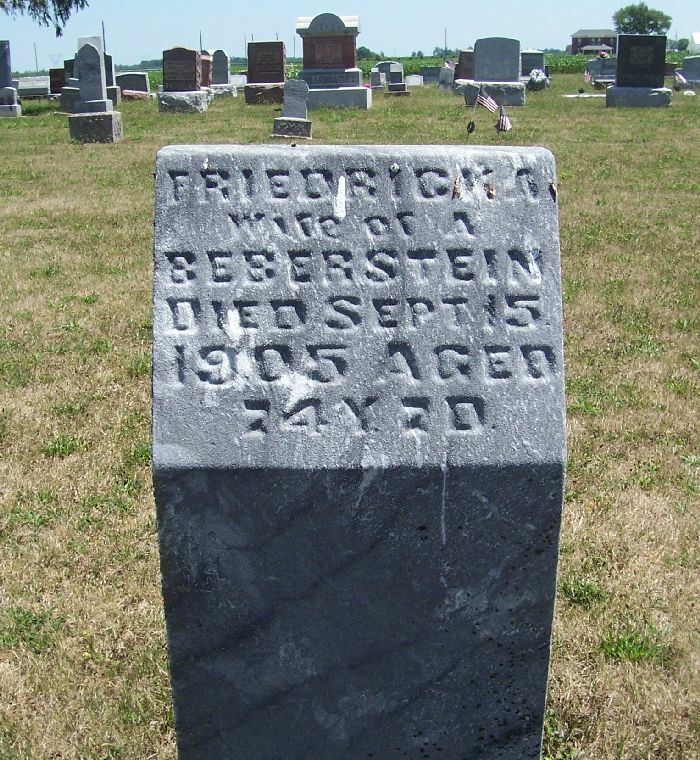 The marker is inscribed: Friedricka, Wife of A Beberstein, Died Sept 15, 1905, Aged 74 Y, 7 d. She is buried near her husband, with two tombstones between theirs. According to the church records of Zion Lutheran, Chattanooga, Friedricka “Biberstein” died 15 September 1905 of pneumonia. She was aged 74 years and 7 days and was buried on the 18th. Her survivors included 1 son, 2 daughters and 16 grandchildren. Other church records show that Friedricka’s maiden name was Stretter and that she was born in Murr, Württemberg. A search on FamilySearch.org indicates that Abraham “Bebertson” married Frederica Streiter on 12 Jun 1856 in Tuscarawas County, Ohio. This location is confirmed by another church record at Zion that states that their son George Washington was born in Sandy Township, Tuscarawas County, Ohio. 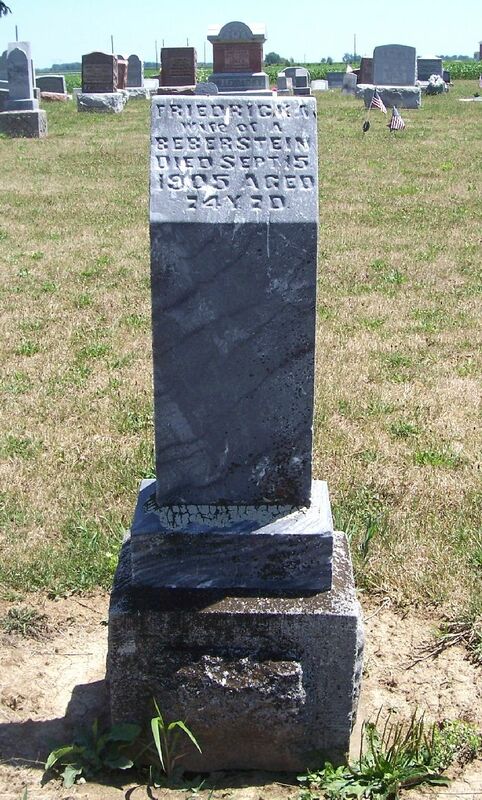 Abraham passed away in 1885 and was the subject of last week’s Tombstone Tuesday. Ohio, County Marriages, 1789-1994,” index and images, FamilySearch (https://www.familysearch.org : accessed 29 July 2012), Abraham Bebertson, 1856. 1850 US Census, Sandy, Tuscarawas, Ohio; Roll: M432_735; Page: 264B; Image: 93 (http://www.ancestry.com : accessed 29 July 2012). 1860 US Census, Sandy, Tuscarawas, Ohio; Roll: M653_1043; Page: 354; Image 297; Family History Library Film: 805043 (http://www.ancestry.com : accessed 29 July 2012). 1870 US Census, Liberty, Mercer, Ohio; Roll: M593_1243; Page: 148B; Image: 301; Family History Library Film: 552742. (http://www.ancestry.com : accessed 29 July 2012). 1880 US Census, Liberty, Mercer, Ohio; Roll: 1048; Family History Film: 1255048; Page: 472C; Enumeration District: 188; Image: 0656. (http://www.ancestry.com : accessed 29 July 2012). I came across your posts on the Beberstein’s while performing a Google search with the surname and year of death. Your posts have confirmed information that I have already found and added more. Thank you. If I may add some more, I have a copy of a newspaper article announcing Friedricka’s death. In the article it notes that she had been living in Ohio, presumably the farmstead, alone, and that her son, George, had finally convinced her to move in with him in Fort Wayne, Indiana. She died a couple of weeks later of pneumonia as noted above. Her husband, Abraham, had predeceased her by 10 years. As far as I can tell, none of the living children remained in the area of the old homestead. You mention above the church records of Zion Lutheran list many details and confirm others. Where are these records maintained? Are they available and accessible to the general public? Finally, I agree, it does appear that Abraham was previously married. If he had children by the first wife, I have not found any evidence of them. There are a couple of Abraham Beaverstine and such in the ‘area’ in 1840 but I have yet to been able to determine if this is the correct Abraham or not. I do have a copy of his naturalization record in Holmes County, Ohio dated 7 May 1847. I also have found a passenger list of an Abraham Biberstine dated 21 Jul 1834. So if the two aforementioned records are accurate, it is possible that Abraham was married before or immediately after his arrival to America. What happened to Anna? I have not found any cemetery records for her. Does the Zion Lutheran Church records mention anything of her? Thank you for all the information you sent. I will look it over and I might add some of the additional information to the past posts. As far as Zion’s church records, I transcribed them and had them printed a few years ago. They cover 75 years of church records, 1855-1930. There are a few copies around. I am not sure where you live but there is a copy at the Mercer County Library and at the Allen County Library in Fort Wayne. I *might* have copy floating around here somewhere. I can look if you are interested. Thanks for reading and for writing!